St. James´ Basilica is surprisingly squeezed among the narrow lanes and streets of the Old Town of Prague. As soon as you enter the building, you are surely stunned by the breathtaking interior. The first thing which catches visitors´ eye is the Baroque organ case build by Abraham Stark of Loket at the western organ-loft. 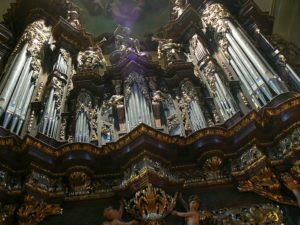 It is the instrument – the largest organ not only in Prague but also in the whole of the Czech Republic – which brings the amazing fame to the Basilica. It mainly serves for the music accompaniment of liturgy, however thanks to its rich disposition it is often used for concerts – Sunday concerts of sacred organ music, several organ concert cycles throughout the year with the International Organ Festival being the most important event, i.e. a unique display of world organ art. The origin of St. James´ great organ dates back to 1705. The instrument had 26 stops and was suitable for the interpretation of Baroque music. The arrival of new music styles – Classicism and Romanticism – brought the need of the instrument’s transformation as the organ did not match the demands of organists anymore. The design was drafted by B. A. Wiedermann, an eminent personality of Czech organ school, a composer and teacher. The commission went to the organ-building factory of Jan Tuček of Kutná Hora which carried out a substantial reconstruction in 1941 – the outcome of that endeavour was a large three-manual electro-pneumatic organ with 75 stops. The next transformation returned the instrument to the Baroque voice pattern. So far the latest major reconstruction was carried out in 1981/1982 by Varhany Krnov company. The new specification of stops restored all of Stark´s original voices and preserved many interesting Romantic tone colours. The present instrument has 4 manuals, 91 speaking stops and 8,277 pipes, which make it sound as a large symphonic orchestra. The instrument suites the interpretation of Baroque music up to contemporary compositions. In 2011 a general modernisation of the organ console was carried out, which at present allows to record 4,000 colour possibilities. However, in recent years we have witnessed certain defections and failures of the instrument. Fortunately, a thoughtful and professional care of an organ maintenance company helps to preserve it in an acceptable condition. Nevertheless, we should be forward-looking – thinking of the future of this exceptional instrument and ensuring continuity of all concerts of sacred organ music. And what treatments are necessary? The whole wind system, originating from the 1st half of the 20th century, is obsolete and near the end of its service and inevitably asks for an essential reconstruction. It would mainly include a construction of new windchests, of a new wind trunk and of a new main bellow. That would also bring a partial renovation of pipes and a modernisation of an electric action. We kindly ask all of you who are concerned about St. James´ Basilica with its phenomena of music to support the reconstruction of one of its jewels! If required we draw up a donation receipt or a deed of donation. Cordial thanks for your prayer, cooperation and support !